Full disclosure: I typically avoid Downtown Disney like the plague. It's not that I dislike it; in fact, I have a rather long, pleasant history with the place. It's just that in its most recent incarnation, the area has failed to appeal to me. Once upon a time, when this area was know as Lake Buena Vista and later the Walt Disney World Village, I spent quite a bit of time here. I recall buying my first Izod Lacoste—complete with the alligator logo—at Sir Edward's Haberdasher. Our first character dining experience took place here aboard the stunning Empress Lily Riverboat. An early version of Chef Mickey's was originally located here, and the predecessor to the Disney Store concept, Mickey's Character Shop, was a favorite location for all things Disney, from Mickey Mouse ears to original cels from the animated classics. The Disney Village, as it was commonly referred to back in the day, was a quiet, laid-back sort of place; it was a respite from the controlled chaos and crazy crowds of the parks, and a place to shop for mostly non-Disney merchandise because believe it or not, Mickey's Character Shop was at one time the only location outside the Disney parks to stock Disney items. When Pleasure Island appeared in the late 1980s, the atmosphere of the Disney Village began its evolution to the more recent look of Downtown Disney. 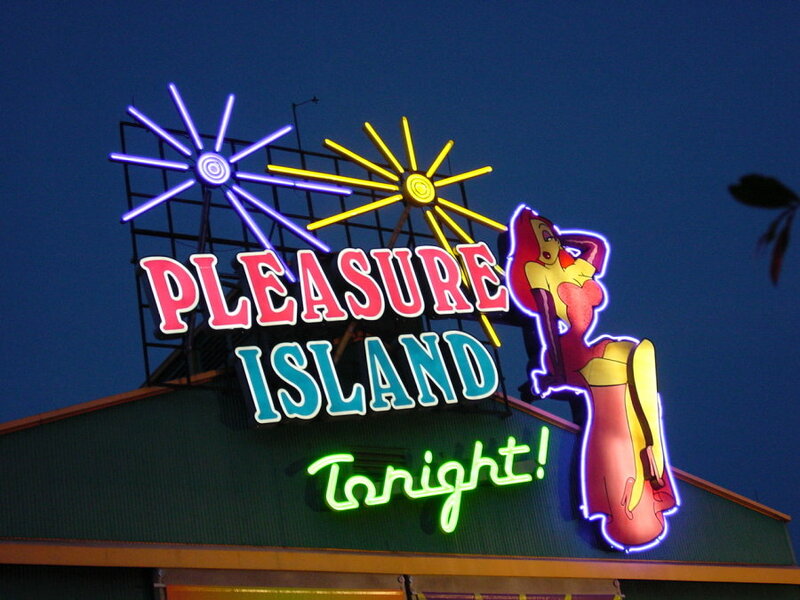 Pleasure Island was originally conceived as a way to keep adult resort guests on property at night and away from downtown Orlando's Church Street Station area as well as Universal's City Walk. A collection of uniquely themed dance clubs and bars, Pleasure Island was Walt Disney World's location for grown-up nighttime fun for guests as well as locals. For many years, it was a huge success. I confess to many hours spent here during my college years—nickel beer Tuesdays was the place to be. Even today, places like the Adventurers Club still have a solid fan base. Suspended Animation was among the best shops on property for animation art and collectibles. A Pleasure Island neon sign features Jessica Rabbit, as seen in 2003. MousePlanet file photo. However, something about Pleasure Island always felt wrong to me. Maybe it was the name, which was featured in Pinocchio as an island where bad boys went to party before being transformed into donkeys. Maybe it was the vaguely non-Disney feel to the place. Originally, Pleasure Island's shops were open during the day with free access to all guests. At night, however, there was a cover charge. This worked because it kept the nightclub feel of the island from spilling into the nearby Disney Village. Several years ago, however, the cover charge was dropped, and with the addition of the West Side, the entire area (now dubbed "Downtown Disney") changed. The West Side is my least favorite part of the entire Walt Disney World Resort; it's tied for my least favorite with the Swan and Dolphin. With its large "big box" architectural style and vast expanses of concrete, the West Side feels like the Target, Best Buy, Home Depot area of "any town, U.S.A." It was hot, sterile, and unappealing. Last week, I paid my first visit to Downtown Disney in six years, and I am very glad I did. Even in its incomplete form, Disney Springs promises a uniquely Disney experience in a well planned, aesthetically pleasing environment that can be enjoyed by adults and families alike. Much of the original charm of this area remains intact; the low-shingled arts-and-crafts cedar siding look of the original buildings continues to permeate this area, and there are huge mature trees that twinkle with white lights at night. There are also several really fine shops here. We took a Disney bus from our resort, so we entered near the Rainforest Café, an unfortunate addition as these restaurants can be found in so many other locations. Still, it is well themed and features an amazing volcano. The Art of Disney remains here as well, offering an interesting collection of Disney art. Sadly, the majority of figurines are very unappealing: cloyingly saccharine Precious Moments, bland white Lennox, dizzyingly busy Jim Shore, and gaudy overly-colorful Britto now line shelves that were once grace by beautifully detailed Walt Disney Classics Collection pieces. Of course, everyone is entitled to his or her collectible of choice, but the fact that it is now next to impossible to find figurines that faithfully recreate characters and scenes from the Disney canon bothers me. The Disney's Days of Christmas shop continues to offer a huge array of Christmas merchandise. There are lots and lots of interesting ornaments; my only complaint is that many of them are heavy or very large. We have a huge Christmas tree in our living room, but many of the Disney ornaments are still too heavy for all but the very lowest branches. Mickey's Pantry is another old favorite that continues to delight with its extensive selection of dinnerware, teas, teapots, and coffee mugs. Once Upon a Toy is another favorite, mainly because there are many "parks only" toys available here, a nice change from the parks that seem to offer an awful lot of Disney Store branded toys. It would be nice to see even more attraction-specific toys here. My sons love the monorail models, and we really wish that Disney would again offer accessories like the Grand Floridian, the Polynesian Village, and Spaceship Earth for present day kids to add to their collections. 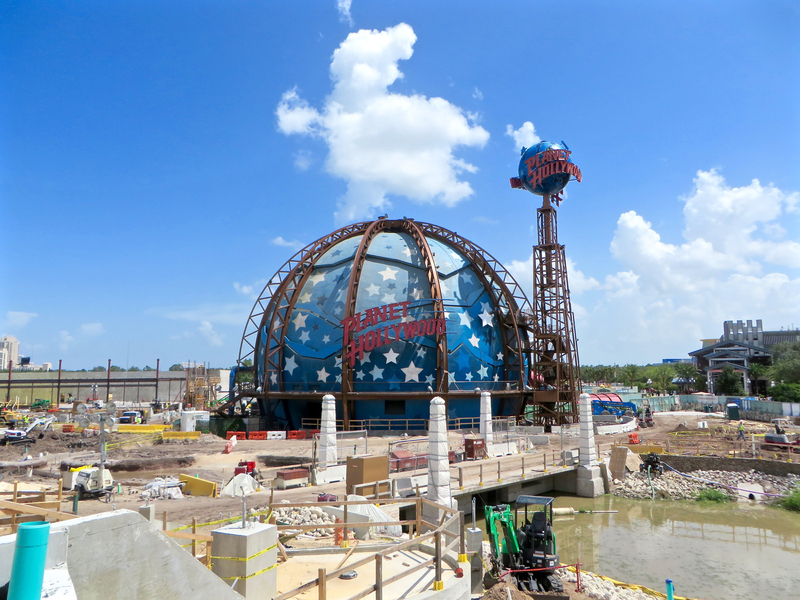 Planet Hollywood remains open amid the ongoing construction. Photo by Alan S. Dalinka. Disney's Pin Traders, that purgatory of merchandise locations, remains, still lacking air-conditioning and now lacking the throngs of eager pin traders that once swarmed this little shop at the height of the pin trading madness. An interesting new addition, the Marketplace Co-Op, recently took up residence in the old Team Mickey location. This eclectic and ever-changing array of shops offers sports apparel, theme park inspired housewares (think Orange Bird pillows and Adventureland themed dinnerware), "vintage" Disney signage, and unintentionally frightening "big eye" interpretations of the classic Disney characters on everything from handbags to lithographs. The newly remodeled Guest Services is located here, as is the venerable Arribas Brothers. My sons are big fans of The LEGO Store, although the one located here is nothing special. It's actually a bit smaller than the two similar stores located near our home. There is, however, a shopping and dining location unlike anything we've experienced before—the T-Rex Café. The retail area, Dino-Store is especially appealing for the little dinosaur fans in your life, complete with a Build-a-Dino area with surprisingly reasonably priced plush dinosaurs. The café was a lot of fun as well; excellent theming, fine service, and decent food. All in all, the Disney Village Marketplace felt fresh and appealing during our most recent visit. The improved walkways really make a difference in the "feel" of this area. 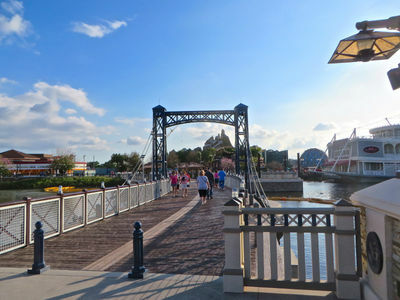 The addition of several pedestrian bridges linking the different areas helps alleviate foot traffic and provides guests with some lovely views of the Marketplace and the nearby Disney's Saratoga Springs Resort. In typical old-school Disney tradition, the bridges themselves are beautiful structures. Lots of textures, colors, and architectural details bring some much-needed life to this area. The newly rebuilt Waterside Stage is a strong addition and provides a much more comfortable venue for the high school musicians and dancers who perform here almost daily. A new pedestrian bridge connects the east and west sides of the Marketplace. Photo by Alan S. Dalinka. Most of Pleasure Island has been demolished and is now referred to as The Landing; The Planet Hollywood building remains, for now, untouched. Fulton's Crab House is still open, but now has a lovely green park in front of it. Other restaurants remain, including The Raglan Road Irish Pub and Restaurant and Portobello Country Italian Trattoria. The surrounding areas now link these nicely themed restaurants to new shops and eateries. Standouts among the shops are Chapel Hats, which offers a great selection of hats at reasonable prices, and The Boathouse merchandise location, which offers unique if pricey) shirts, hats, and nautically-themed home accessories. Speaking of The Boathouse, this is a welcome addition to the eateries and bars of Downtown Disney. We spent several hours here enjoying the view and the adult beverages on a warm summer evening. 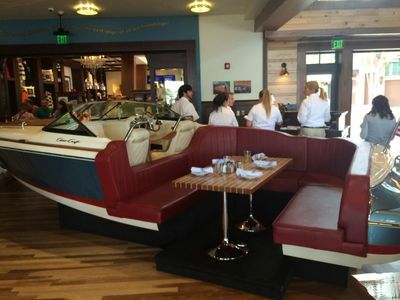 The nautical theming at The Boathouse includes a watercraft that has been converted to seating for diners. Photo by J. Jeff Kober. The most encouraging news is that the recent additions here—the walkways, the lighting, the landscaping—are up to Disney standards. There is good news to report about this corner of Disney Springs as well; landscaping and "remains" of an elevated railway add interest and much needed shade to this area. There's an interesting new Starbucks here, and the AMC Theaters, Splitsville Luxury Lanes, Cirque du Soleil theater, the House of Blues Music Hall, and Bongos Cuban Cafe continue to do business here as well. There's also the enchanting Characters in Flight hot air balloon ride. It was recently announced that DisneyQuest will be leaving in the very near future. While I recall spending one relatively entertaining day here many years ago, I welcome this change; the concept of Disney Quest has outlived its welcome. For the first time since this area opened, it provided an interesting and enjoyable walk. We visited on a Saturday night, and the entire Disney Springs area was packed. It felt great. There were groups of adults and lots of couples in The Boathouse, lots of families with children of all ages strolling the attractive walkways outside, and live music at every corner. It seems that after nearly 25 years, Disney has successfully created a space that meets the needs of all its guests. I can only look forward with great hope to the many new additions currently under construction in this corner of the Vacation Kingdom of the World. 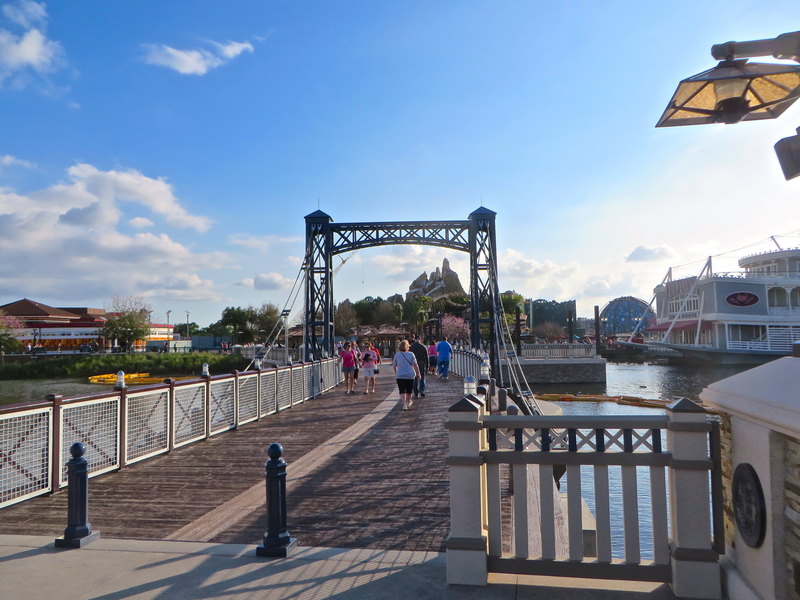 Have you visited Disney Springs recently? If so, please share your thoughts. I went last year when construction was in full swing. I felt the place was getting better although Pleasure Island was still behind walls. Whatever you feel about it, it is only worth a few hours of your time. Maybe eat a meal and browse a few shops. Then it gets old quickly and you'll want to leave because the number of people visiting makes it a madhouse. I live in the Los Angeles area and visited Anaheim's Downtown Disney frequently. I never seen as many people in World of Disney as there was in Orlando. It sort of takes the shopping experience into a new level of appreciation, yet I could not bring myself to spend my money. The prices are astronomical. I recommend the Disney Dining Plan or otherwise, I wouldn't have eaten there. The place is vast. Walking from one side to the other proves impossible. Either take the bus or use the boats. Either way, don't walk too far to the other side or you'll wear out.